Hayden Panettiere is Just Like Us! Except for the Whole Celebrity Thing. The Nashville starlet dishes being a style role model, her favorite old sweater, and go-to karaoke songs. 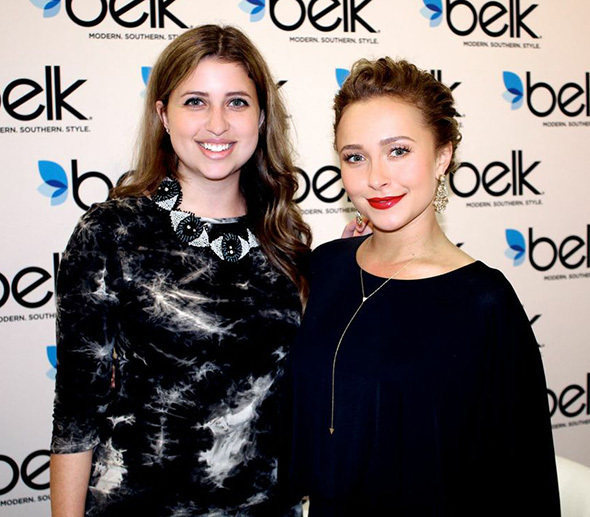 I recently interviewed Hayden Panettiere, who was in town to celebrate the opening of Belk at the Galleria. I was unsure of what to expect. How would she stack up against her current role as the occasional-diva country singer Juliette Barnes on Nashville? But from the moment she walked into the room, in a Trina Turk dress and stilettos, she was all smiles and jokes. The interview started off with an unexpected compliment—she spotted my florescent pink Cambridge Satchel Company bag and gushed about how she loves the hue. By the end of the interview, I felt like I was chatting with a good friend (with whom I share a love of Cards Against Humanity, Shel Silverstein, and Italy). Read on to get all the details on my newest girl crush (and soon, yours too). Margaux: Is this your first time in Dallas? Hayden: It’s not my first time in Dallas, but my first time in a while. I haven’t spend an exorbitant amount of time here. M: What are you wearing right now? M: Do you feel a lot of pressure being a style role model? H: Yes, because it’s definitely not what I signed up for. I mean, I know it comes with the territory. But especially with my body type, because it’s not like I can just throw anything on. I really have to think about what’s best for my type and try to make myself look much taller and longer than I am. It’s taken many years to get the hang of it, and I’m not sure that I’ve fully gotten it. There is room for a lot of mistakes. Trial and error, and of course, it’s going to be splashed all over Google for the rest of your life. M: Is there a fashion trend you have regretted wearing? H: Oh, which one? I mean, when I was younger, there was those necklaces that looked like wires. They were plastic and strechy. There are several photos of me wearing them. I also feel like fake tattoos were in. M: Do you have any clothing items or accessories you can’t live without? H: I have a fuzzy cashmere sweater that I got when I was sixteen. They used to have to chase me around and pull it off me and promise it’d be back by the end of the day so they could dry-clean it. I still have it, years later. It’s one of those things where I’ll lose track of it for a second, then I’ll go back to it. M: What’s your favorite thing to do when you’re kicking back and relaxing? H: When I have time to relax, I really relax. I love to lounge on the couch. I love to barbecue with my friends. We also play Cards Against Humanity. If you ever have a dull moment, just pull out Cards Against Humanity. M: Where’s your favorite place to travel? Hayden: There’s the running joke of “everywhere you travel, looks like somewhere in California.” I like to feel like I’m not in Kansas anymore. I love Italy because you can get it all there. There are rolling hills and beautiful water, and there are also fun cities. I also love Croatia. It’s really awesome; it has those narrow cobblestone streets and the capital is almost like Capri. Just me and my friend, Hayden. M: I know you sing a lot with your role on Nashville. Do you have a favorite karaoke song? H: My go-to is usually Hell on Heels. But if I’m being really gutsy, I might go Sweet Child O’ Mine to end the night. Because, you know, my voice isn’t going to be sounding too hot after that. M: What’s your favorite book? H: One of my favorites is The Art of Racing in the Rain. I love it. I used to read a lot of Chicken Soup for The Soul and Shel Silverstein poetry. M: What about a favorite movie? Hayden: I have very few favorites. It depends on what my mood is at the moment, but I always love watching Moulin Rouge. That is one of the best movies. Of course, Titanic. I don’t watch a lot of movies over and over again, but those are a few I can. M: Okay, now let’s play “this or that.” I’ll give you two choices, and you pick one. First up: heels or cowboy boots? H: Oh, if you had said just boots, not cowboy boots, my answer would be different. But heels. M: Pink or red nail polish? H: Dogs. But don’t get me wrong, I’m a Leo, so I love cats. H: Oh no, you’re going to put me on the spot? Right now, I’m digging singing because it’s new and I’ve been acting my whole life. I love acting, but singing is something new and different.